If you’ve read my blog for a bit (or if you live nearby), then you fully understand the draw of Wisconsin on the weekends. I know I’ve said it before but all my weekday stress melts away, the moment I cross the state line. Some summers, the BOY and I have had more time to explore the state than others. This year, we started early with a quick overnight up in Green Lake. Saturday morning, we woke up early and then went back to sleep for an hour, hitting the road way later than expected. 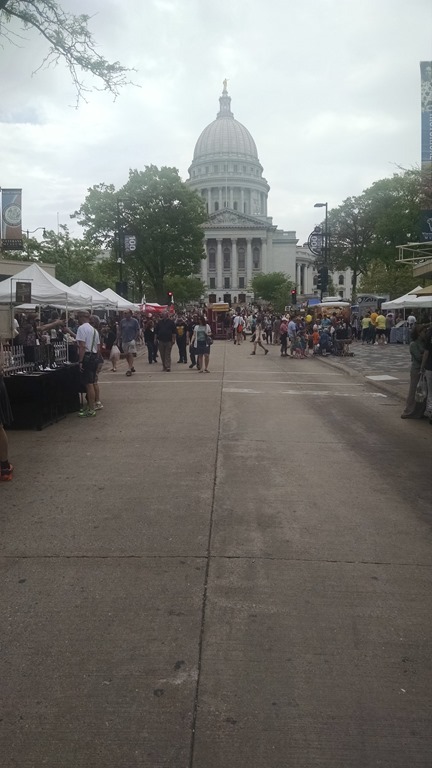 Our first stop was Madison to check out their world famous farmer’s market. Without planning, we arrived at the spicy cheese bread corner. YUM! It was amazing and made the perfect mid morning snack. We walked all along the market loop (in the wrong direction) admiring the plants and produce and eying the cheese and cookies. We decided that we would definitely make a trip back up to Madison and spend more time at the market and check out the shops and restaurants. But for now, we continued on our journey up north to the lake. We are lucky that we have amazing friends who let us stay at their place this weekend. We arrived in time for lunch (sausages on the grill), and then we dove right into the ‘lake life’ with beer and fishing on the pier! After our unsuccessful fishing mission, the BOY took a nap while I read my book. Then, we went back down to the pier to watch the sunset. We had a late dinner and played games until we crashed in bed! Sunday morning, it was back on the pier for breakfast and fishing. This time, we actually caught a fish! 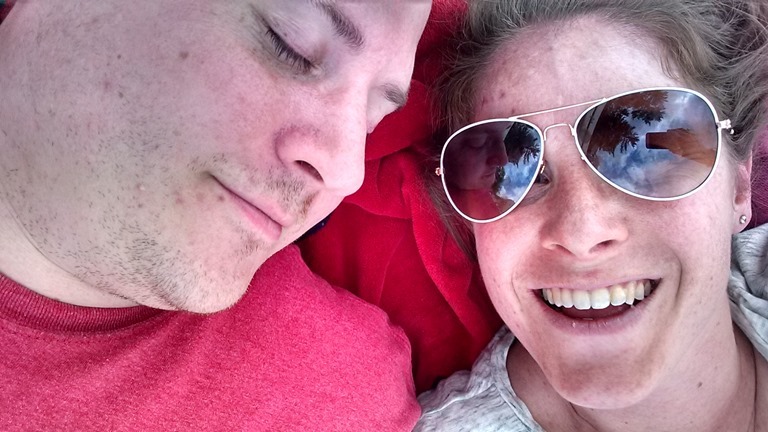 I took a nice long walk and then the BOY and I spent the day laughing, talking, and playing games until it 4pm, when it was time to drive back home. It was sad to leave, but exciting because the BOY and I had a wonderful weekend together unplugging and bonding. And, we are heading back up to Wisconsin with my family and our friends in a month. I feel super recharged! Woo hoo! Where do you like to go for weekend Getaways? I love your pictures of the water…..! Did you release the fish or cook him? or a friend! when it warms up! That cheesy bread 🙂 🙂 so much love for that stuff. You were THOSE people, walking the wrong direction? Haha just kidding of course. When you’re on vacation you can do whatever you want, right? So glad you guys got to get away! Looks like it was a beautiful, peaceful weekend. It took us a little while to figure out that people were serious about their walking : ) I guess we always do like to walk our own direction. I’m still dreaming about that bread!